Wood is unique in that no two pieces are identical. Each piece of wood has its own distinctive personality, which stems from its grain-pattern, color, and texture. 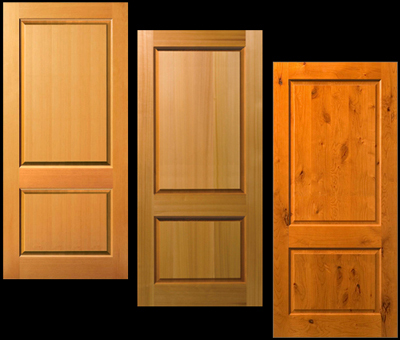 Although doors are displayed in Fir, Cedar, or Knotty Alder, any door can be built in any species requested. Embrace the exclusivity of wood by selecting the species that best suits your tastes. Pricing on wood species varies based upon door design. Please ask your B.C. Door representative for a quote on the specific species you are interested in. Pattern #416 shown from left to right in Fir, Cedar, and Knotty Alder.